Computer Science 12 Edition Computer Science: An Overview is intended for use in the Introduction to Computer Science course. It is also suitable for all readers interested in a breadth-first introduction to computer science. 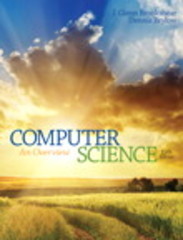 Computer Science uses broad coverage and clear exposition to present a complete picture of the dynamic computer science field. Accessible to students from all backgrounds, Glenn Brookshear and Dennis Brylow encourage the development of a practical, realistic understanding of the field. An overview of each of the important areas of Computer Science provides students with a general level of proficiency for future courses. This new edition incorporates an introduction to the Python programming language into key chapters. Teaching and Learning Experience This program will provide a better teaching and learning experience–for you and your students. It will help: Develop a Practical, Realistic Understanding of Computer Science: An overview of each of the important areas of Computer Science prepares students for future courses. Fit your Course Preferences: Individual chapters are independent and can be covered in an order that suits your course. Use Python to prepare students for future courses: A new focus on Python provides programming tools for exploration and experimentation. Reinforce Core Concepts: More than 1000 Questions and Exercises, Chapter Review Problems, and Social Issues questions give students the opportunity to apply concepts. Support Learning with Student Resources: The Companion Website www.pearsonhighered.com/brookshear features resources that enhance learning.